Larry BirdBasketball was born in Massachusetts. But it grew up in Indiana. The fit was better here.Dr. James Naismith, a professor, conceived the roundball game at the college where he taught in Massachusetts, in 1891. Its original purpose was to provide some recreation, and exercise, for college students in their spare time. Basketball was born in Massachusetts. But it grew up in Indiana. The fit was better here. Dr. James Naismith invented the roundball game in 1891, to give students at the Massachusetts college where he taught an indoor sport to play during the winter, when it was cold and snow was on the ground in that New England state. Its popularity spread rapidly, and by 1893, just two years later, the first Indiana team was organized, at Crawfordsville. Then 18 years after that, Indiana began its state high school basketball tournament, in 1911. Wonder why basketball turned into Hoosier Hysteria here in the land of Johnny Appleseed, James Whitcomb Riley, and Cole Porter? As opposed to its maybe becoming identified with Ohio, or Rhode Island, or Utah? Well, for one thing football seems to have gained an earlier and firmer foothold (no pun intended) in other states than it ever did in Indiana. The gridiron sport requires several people to be played, while Indiana farm boys (and girls) could shoot baskets and practice their dribbling in any spare time they had, after doing their chores, going to school, etc., and all by themselves, if necessary. Indiana was more rural than, say, Ohio or Illinois. A win in the regional (the tourney one step up from the sectional, for any non-Hoosiers) was usually not considered much of a chance in the small schools; and anything beyond that, nearly impossible. The “big city schools” always won the semi-state and state, small town and rural Hoosiers were convinced. Except, not always. Thorntown won “the state” in 1915. In the 1910 census, the population of Thorntown was 1,508. In the 2010 census, it was 1,520. In Indiana, some things change very little in a century. And in 1954, many years later, the colossal state finals upset of all time left the Milan Indians as a Hoosier legend. The Indians, from a little school in a little town in Ripley County, southeastern Indiana, defeated the mighty Muncie Central Bearcats, 32-30, on a last-second shot by the Indians’ star shooting guard, Bobby Plump, who was later chosen “Mr. Basketball” in Indiana for that year, and earned other honors in his college career. “Mr. Basketball” in Indiana is the Number One player chosen for the post-season state All-Star Team. For those of you who aren’t from Indiana or never lived here, if you saw the movie “Hoosiers” from 1986, that’s the Milan story, with different names for the town and the characters and some dramatizations added to the plot. The movie’s coach Norman Dale was Milan coach Marvin Wood. Jimmy Chitwood, the troubled star who sank the game-winning shot, was Bobby Plump. And so on. A team that the Indians defeated in the semi-finals — or “semi-state,” as we Hoosiers call it — was the Crispus Attucks Tigers from Indianapolis, an all-black school in the days before many Indiana schools were integrated. A super-talented sophomore on that team was a boy named Oscar Robertson, born in Tennessee but raised in Indiana. He went on to lead his school to two straight state championships, had a terrific career with the University of Cincinnati, and an even better one with the Cincinnati Royals and Milwaukee Bucks. He was the best Indiana basketball player of all time — up to THAT time. More on that a little later. I met Robertson once after his professional career, when he came to Madison to sign some autographs for fans at a Clifty Drive restaurant. I found him to be business-like and not overly friendly. But that’s neither here nor there. My own hometown of Madison, Indiana (southeastern also) had a period of considerable accomplishment in basketball from about 1941 to 1950, then another one in the late ’50s and early ’60s. A new coach hired in 1939 at Madison High School, Ray Eddy, took the Madison Cubs to the final game of the state tournament in 1941, although they — sadly — lost to Washington, 39-33. Then in 1949, the Cubs made it to the final game again — only to be edged by Jasper, 62-61. But Madison had its first “Mr. Basketball” that year, a hot shooter named Dee Monroe who scored 36 points in the championship game, a record for the finale at that time. And the next year — finally — the Madison Cubs became state champions, easily downing the Lafayette Jefferson quintet, 67-44, in the final game. And they did it absent their star center, Spence Schnaitter, for most of the game, as Schnaitter received an injury early on and Eddy had to take him out. Sophomore center Morrie Lorenz came in and subbed for Schnaitter quite capably, and the rest of the starting five took up the slack. To date, Madison hasn’t won another state championship in basketball, but in the years 1959-’62, the Cubs went undefeated during the season, three straight years. Their coach in those years was a guy named Julius “Bud” Ritter, who had played on the Evansville Bosse Bulldogs state champs of 1944 and 1945. The key player in that long series of successes was a tall, awkward-looking All-Star named Harold “Buster” Briley. Briley, an amiable young man, well liked but with a host of funny anecdotes that swirled around him, played forward. And he did things HIS way. Like Frank Sinatra, you might say. Briley was a top scorer, sinking 1,985 points in four seasons in which he started every varsity game. And don’t forget, there was no 3-point shot in those days. He had a wonderful shot from the left side, cattie-cornered from the basket (there’s a Hoosierism for you!) It was a one-hand set, although he did sometimes shoot jumpers –usually at the climax of a fast break. On his set shots, the ball would float up toward the basket, and the fan’s first thought might be, “Oh, Buster, it was too soft! It’s going to fall short!” But if you thought that, you obviously hadn’t seen Buster play before. His soft shots kept going, and going, and finally, SWISH! Two points. And in the era of the late 1950s, when 6-4 forwards didn’t normally dribble the ball very much, Buster often did. And that was something to see. He wasn’t exactly a ballet dancer when it came to grace and agility. I can still see him roaring down the court at full speed, dribbling the ball in his own inimitable way, with his palm instead of his fingers, up high around his waist, glancing from the ball to his path and down to the ball again, constantly. But here’s the thing: You seldom saw anyone steal the ball from Buster Briley. He had it under better control than he appeared to have. 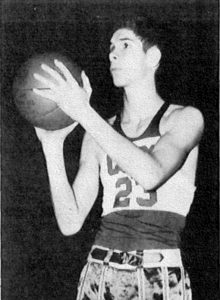 All-Star forward Larry Humes played the second leading role in those Cubs successes, and was chosen Mr. Basketball for the state in his senior year of 1962. Humes was a top-notch scorer and rebounder. All of us Madisonians felt that Briley should have gotten the honor, two years earlier; but instead it went to Ron Bonham, of Muncie Central, which had defeated the Cubs in the semi-state. Briley came in second. Both Briley and Humes starred on the court at Evansville College. Indiana state basketball, with one path to the state championship for any team in the state, went on through the 1960s, ’70s, and ’80s. In the late 1990s, it was changed to a multi-class tournament, as it had been in most states for many years. Lots of Hoosiers were unhappy about that, but it did give the smaller schools more of a chance to win a championship of their own. From the late ’60s, up to the start of the 21st Century, a number of other outstanding young Hoosier players went on from high school to college and, in some cases, to the NBA as well. George McGinnis and Reggie Miller, both from Indianapolis; Steve Alford of New Castle, and Damon Bailey of Bedford North Lawrence come to mind. Also the Zeller brothers — Tyler, Cody and Luke — from Washington, Indiana. BUT — and I know that everyone familiar with basketball was waiting for this: The best basketball player ever to come out of Indiana; possibly the best from ANYWHERE — was a working-class Hoosier boy from French Lick. 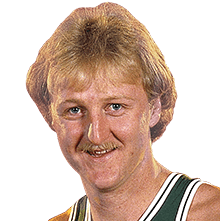 Larry Bird was his name. In a basketball world which was already being dominated by black players when he was in high school, this tall, lanky White kid with a typical Hoosier boy grin went from Springs Valley High School (graduating in 1974), to Indiana University for about five days, then over to Indiana State University at Terre Haute, where he had an unbelievable career. Dead-eye shooter, extremely clever passer, strong rebounder, good ball handler who wasn’t afraid to dribble it up the floor. He was a basketball genius who always seemed to be five to 10 seconds ahead of everyone else on the floor in visualizing mentally what was going to happen next, and how to handle it. Basketball commentators liked to say that he was “not very fast,” and “couldn’t jump very well,” but they say that about every White player. It didn’t seem to hamper him any. And he would! And in the clutch, if the Sycamores, or the Celtics, were behind by a few points and desperately needed a field goal — or two or three — Bird would say, laconically, “Gimme the ball.” He had ice water in his veins. Nine times out of 10, he’d pull the team across the finish line ahead of the opponents. So, for any of you who aren’t Hoosiers, who never have lived here, that’s a brief rundown on why they call it Hoosier Hysteria. For those of you who ARE from Indiana, hope you’re thinking, “Thanks, Wayne, for the memories!” about now. Awesome! Nuff said! Thanks, Old Corporal! Briley had a great time at Evansville college. Did the pros have a look at him? I think they did, Greybeard. But he didn’t really have ball-handling ability that would have matched up with his extreme shooting prowess. May not have been quick enough for the pros, either. Thank you for your comment.